Happy Birthday to Emmy Noether “The most important woman in the history of mathematics” #WomenInSTEM #WomensHistoryMonth #WHM15 « Adafruit Industries – Makers, hackers, artists, designers and engineers! Emmy Noether (official name Amalie Emmy Noether; 23 March 1882 – 14 April 1935), was an influential German mathematician known for her groundbreaking contributions to abstract algebra and theoretical physics. Described by Pavel Alexandrov, Albert Einstein, Jean Dieudonné, Hermann Weyl, Norbert Wiener and others as the most important woman in the history of mathematics, she revolutionized the theories of rings, fields, and algebras. In physics, Noether’s theorem explains the fundamental connection between symmetry and conservation laws. She was born to a Jewish family in the Bavarian town of Erlangen; her father was mathematician Max Noether. Emmy originally planned to teach French and English after passing the required examinations, but instead studied mathematics at the University of Erlangen, where her father lectured. After completing her dissertation in 1907 under the supervision of Paul Gordan, she worked at the Mathematical Institute of Erlangen without pay for seven years (at the time women were largely excluded from academic positions). In 1915, she was invited by David Hilbert and Felix Klein to join the mathematics department at the University of Göttingen, a world-renowned center of mathematical research. The philosophical faculty objected, however, and she spent four years lecturing under Hilbert’s name. Her habilitation was approved in 1919, allowing her to obtain the rank of Privatdozent. 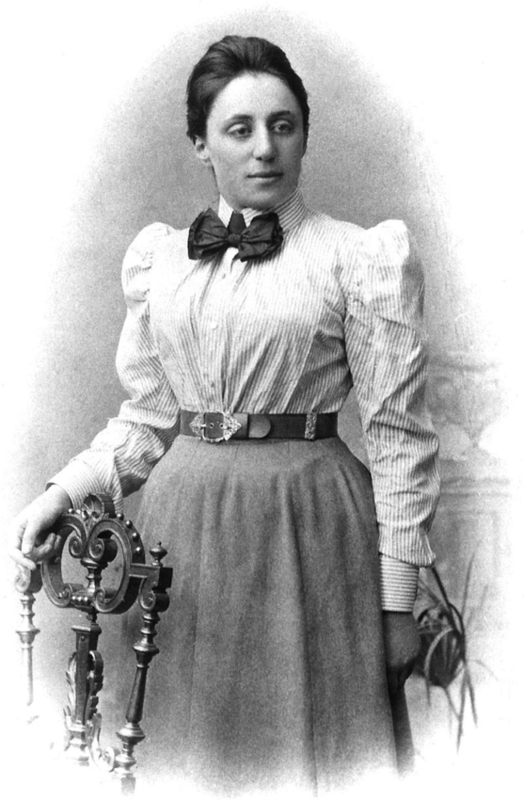 Noether remained a leading member of the Göttingen mathematics department until 1933; her students were sometimes called the “Noether boys”. In 1924, Dutch mathematician B. L. van der Waerden joined her circle and soon became the leading expositor of Noether’s ideas: her work was the foundation for the second volume of his influential 1931 textbook, Moderne Algebra. By the time of her plenary address at the 1932 International Congress of Mathematicians in Zürich, her algebraic acumen was recognized around the world. The following year, Germany’s Nazi government dismissed Jews from university positions, and Noether moved to the United States to take up a position at Bryn Mawr College in Pennsylvania. In 1935 she underwent surgery for an ovarian cyst and, despite signs of a recovery, died four days later at the age of 53. Noether’s mathematical work has been divided into three “epochs”. In the first (1908–19), she made significant contributions to the theories of algebraic invariants and number fields. Her work on differential invariants in the calculus of variations, Noether’s theorem, has been called “one of the most important mathematical theorems ever proved in guiding the development of modern physics”. In the second epoch (1920–26), she began work that “changed the face of [abstract] algebra”. In her classic paper Idealtheorie in Ringbereichen (Theory of Ideals in Ring Domains, 1921) Noether developed the theory of ideals in commutative rings into a powerful tool with wide-ranging applications. She made elegant use of the ascending chain condition, and objects satisfying it are named Noetherian in her honor. In the third epoch (1927–35), she published major works on noncommutative algebras and hypercomplex numbers and united the representation theory of groups with the theory of modules and ideals. In addition to her own publications, Noether was generous with her ideas and is credited with several lines of research published by other mathematicians, even in fields far removed from her main work, such as algebraic topology.